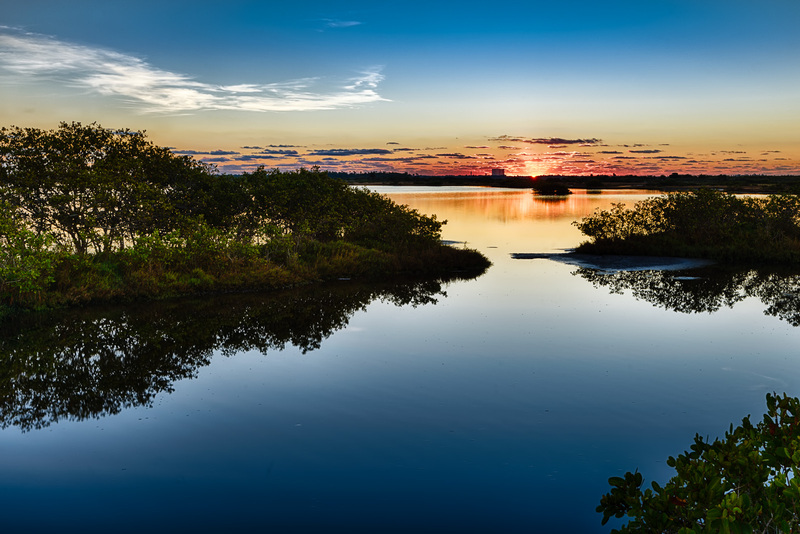 I spent last Thursday morning at Merritt Island National Wildlife Refuge. It’d been a while since I tried for a sunrise photo, so I went over early. There wasn’t a lot of color in the sky, but the scene was still pretty. 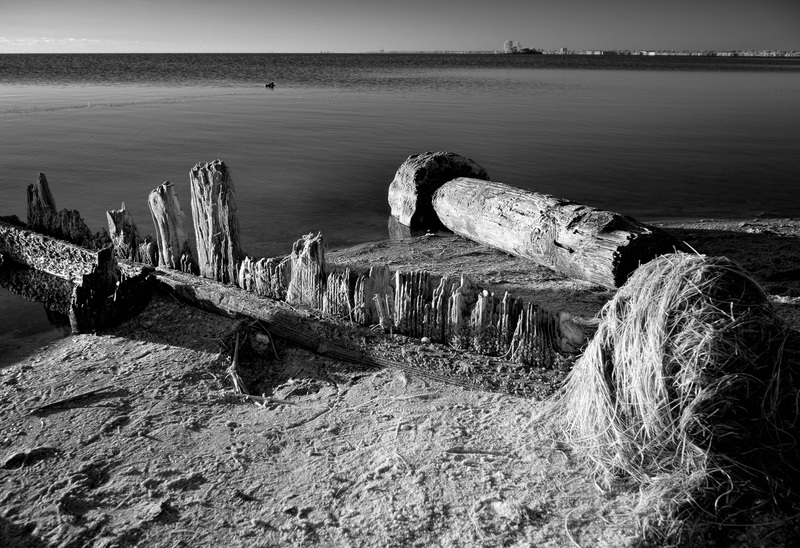 After sunrise, I stopped by this decaying dock – there won’t be anything left of it soon. The strong side light from the early morning sun helped capture detail and texture in this black and white, infrared photo. When I left this spot, I drove back around East Gator Creek Road. There was a huge flock of ducks in a V-wedge heading for the full moon that was setting in the west. I couldn’t get my camera ready in time to capture the sight, so I just watched. It would have made a wonderful photo. There were many birds on East Gator Creek and on Black Point Wildlife Drive although the numbers weren’t as great as some other times I’ve been there. Most of the regular birds were around including various Herons and Egrets, Belted Kingfishers, Wood Storks, Ospreys, Cormorants, Anhingas, Gulls, Terns, Brown Pelicans, White Ibis, Vultures, a Bald Eagle, Sandpipers, Roseate Spoonbills, Grebes, and a few others. I also saw some winter migrants including White Pelicans, Northern Pintails, Savannah Sparrows, and what I think was a Northern Flickr. For some reason, most of the birds were in the distance – too far away for good photos. 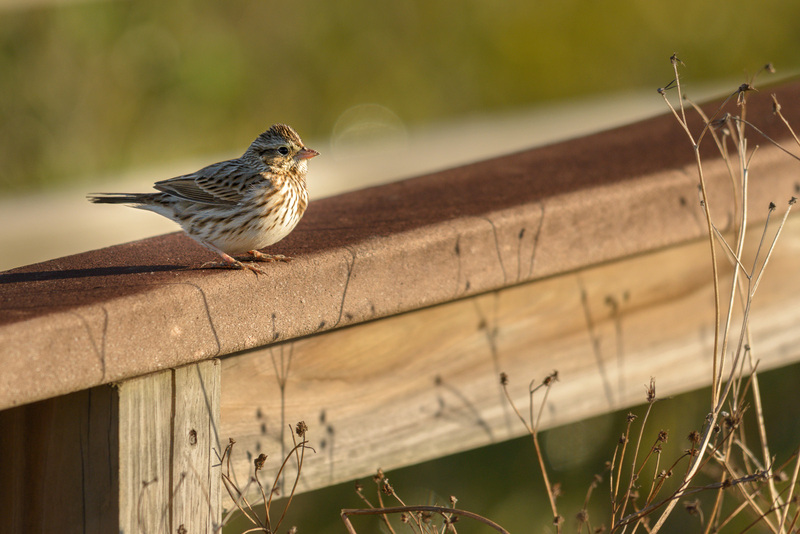 This sparrow though was very close. I also came across several wild boars, including this one. 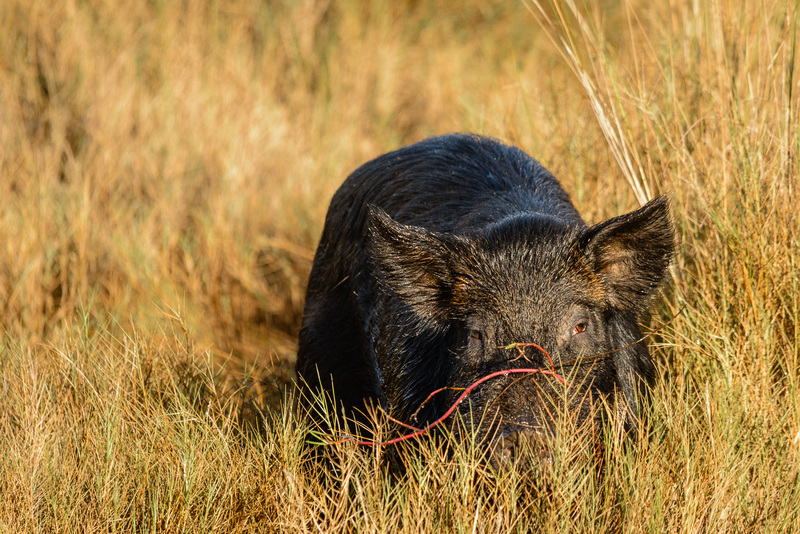 Making a pig of itself — A wild boar stops foraging for a moment to give me the evil eye this morning on Black Point Wildlife Drive. I’m even more distrustful of these animals than alligators. Wild boars can be aggressive and threatening. I was returning to my car once and found a mother with several piglets scouring the ground for food near my path. I went out of my way to go around them and tried to keep as much distance between us as I could. Even so, the mother watched me closely and grunted at me as I got to my car. The one in the photo above was on the other side of a ditch full of water and I was close enough to my car this time to jump in if it came toward me. But I still didn’t like the way it watched me. Another interesting day with lots to see. You can click on the photos above to view a larger version and you can look at this set on Flickr to see these and many other photos from Merritt Island National Wildlife Refuge.